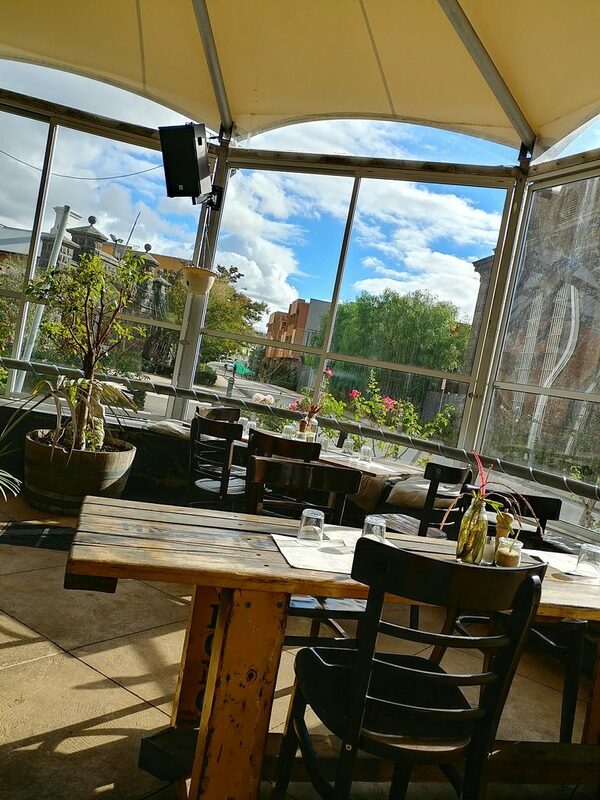 The Glass Den was on a few lists of Melbourne brunch spots, so, of course, made it on to ours. And so it was that we hauled a couple of our Melbourne resident friends who had somehow never been there up to out-of-the-city Coburg. Much as it seems a hassle for those who live in the city to go more than one or two suburbs away, it is actually very easy to get to The Glass Den from the city. There is a single direct tram route there, and a short walk. 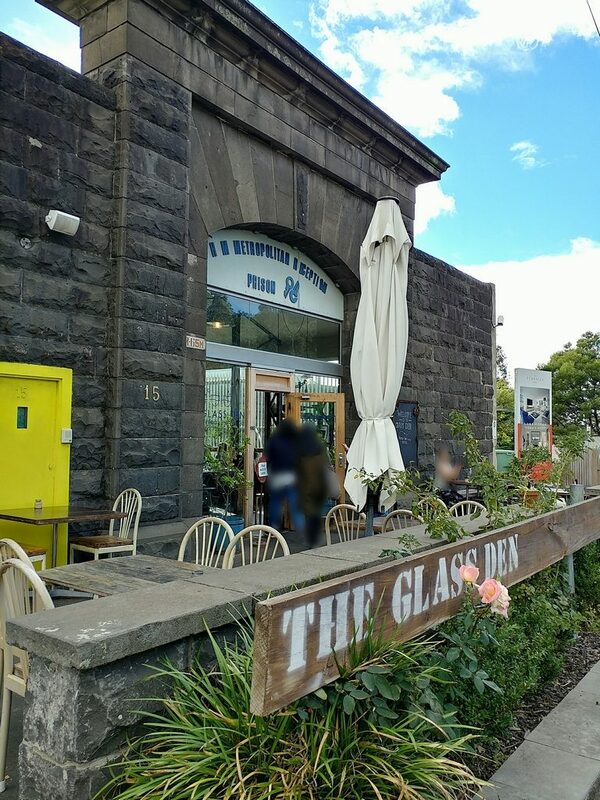 Housed in what was once one of the Pentridge Prison buildings, it brings a very different story to the building’s history. The imposingly solid stone walls felt jarringly anachronistic in the middle of an otherwise suburban landscape on a bright, crisp weekend morning. “The Glass Den” was stencilled onto a wooden board at the front of the building, to reassure those as thrown as we were that this was the right place. The outside of the building housing The Glass Den, with imposing stone. We were greeted soon after we entered, and shown to available seats in a covered conservatory-style section, just beyond the main area. As we discovered when we had finished our meal and were leaving, arriving early was a wise move, as there was a long line of hungry diners waiting for tables by the time it got to later in the morning. With the glass walls allowing a view out to residential streets, growing greenery, and a bright blue sky outside, it was hard to imagine the grimmer past that had transpired there. The decor was was simple and rustic, with solid wooden tables and a few different styles of cafe chairs matched with them. The main area had polished concrete floors and high ceilings. The original gates from the prison building had been kept, and acted as a division between the sections. The conservatory like area, and the outside world beyond. Indie, mostly instrumental music played not too loudly in the background. The clanks of coffee cups and the sounds of the grinder and tamping of coffee frequently rose from the busy coffee service area. A glimpse into the main room, where the caffeination comes from. There were many tempting options on the menu, a single sheet of paper with drinks on one side and food on the other. 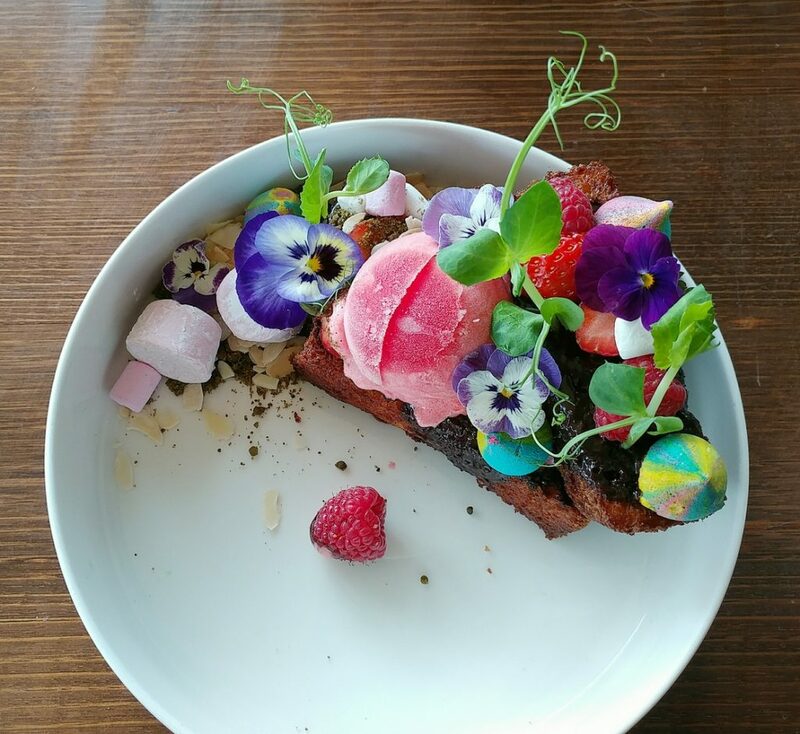 They have an all day menu, with savoury options taking up about the top three quarters of the page, and sweet treats on the lower quarter of the page. That is not necessarily reflective of their proportional temptingness though. It took a while, but we did eventually decide on what to have. Between us, we ordered the Sous vide lamb shoulder benny, the Savoury glazed doughnut, the Bao burger, and the French toast churros. We began with caffeination. One of us had a flat white. 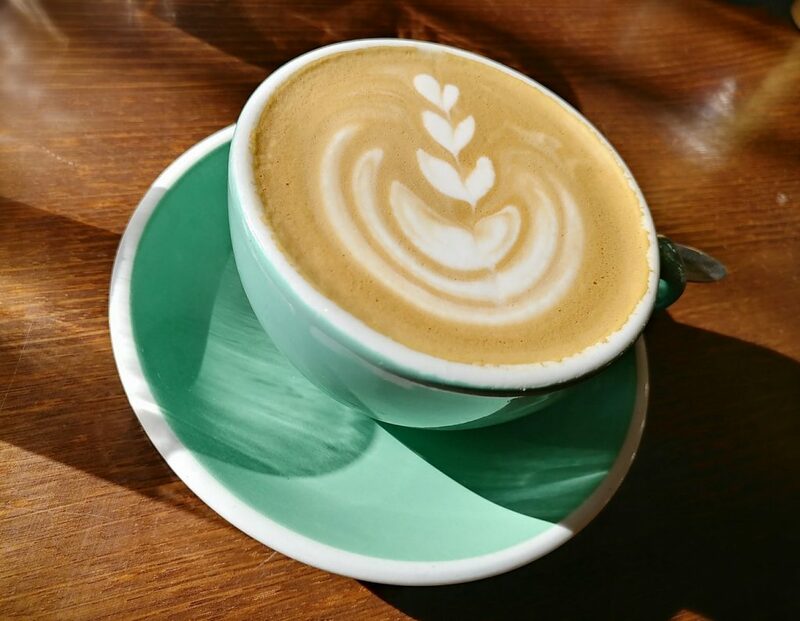 Their coffee is from St Ali, and it delivered the rich, fruity flavours as anticipated. 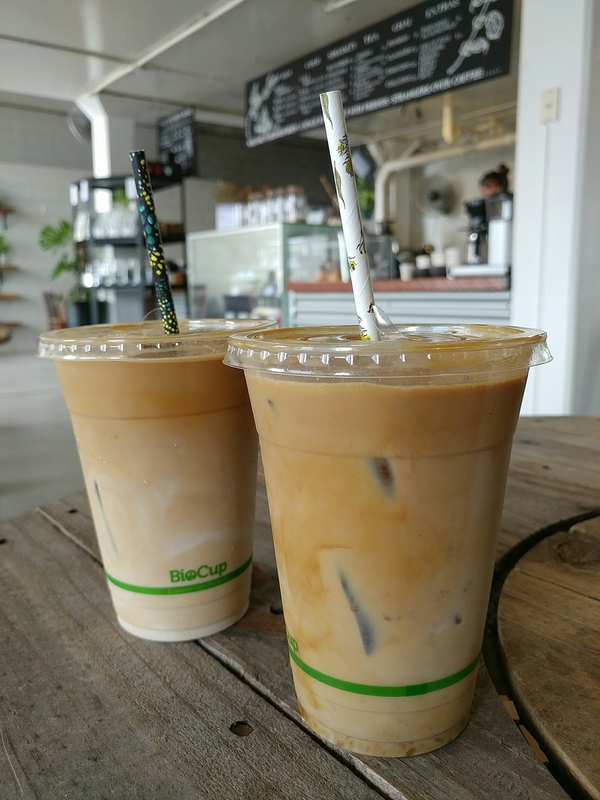 The rest of us had our interest piqued by the description of their iced coffee, and ordered that, despite it being quite cool outside, and still having our coats on indoors. 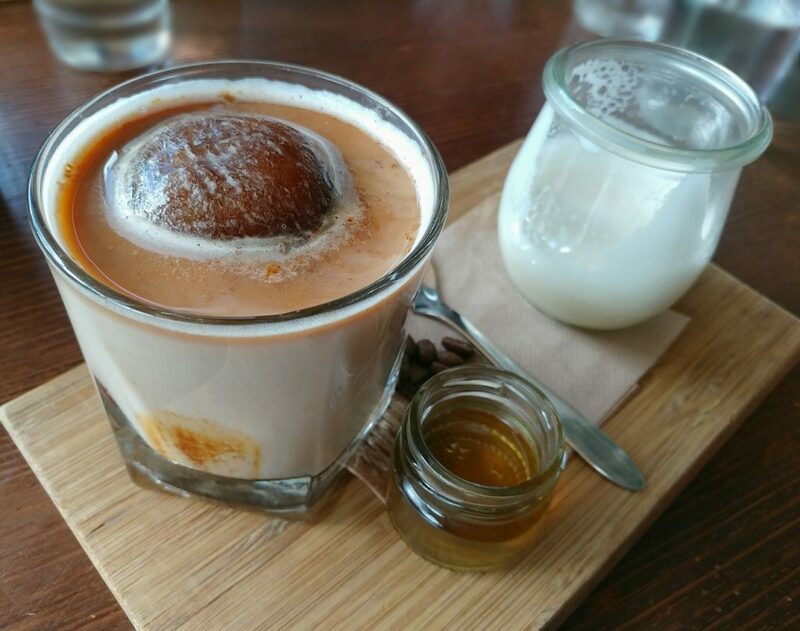 It is described in the menu as a frozen sphere of coffee served with a choice of hot milk and sugar syrup. The presentation was both a bit elaborate, and precisely as described. 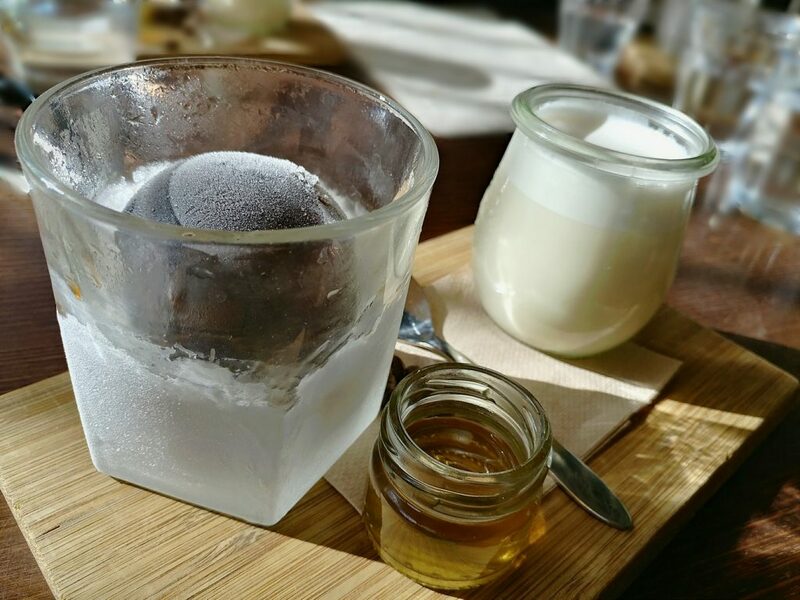 On a wooden board came the glass with large frozen coffee sphere, looking a bit like the Death Star, a jar of hot milk, and a little pot of the golden sugar syrup. It was fun having an interactive part of the meal..at least to start with. 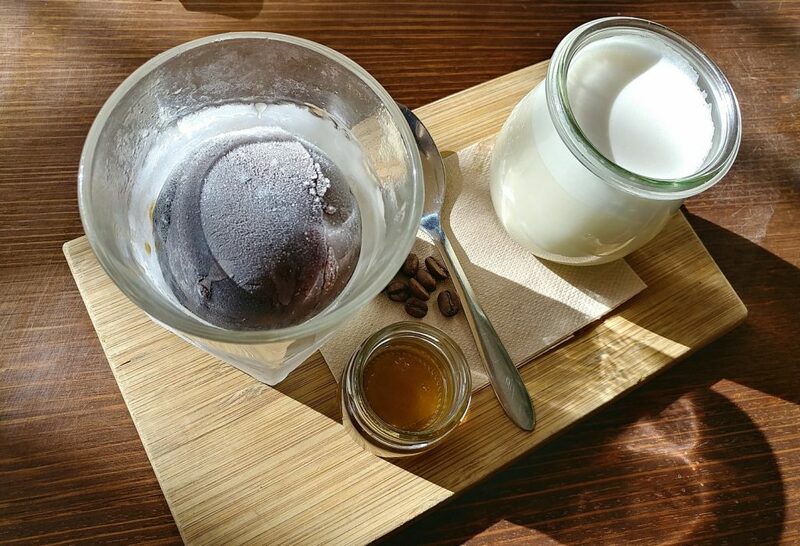 The hot milk, when poured into the glass with the ice sphere, was meant to melt it, but it actually took quite a while to melt enough for you to have more than milk with just a hint of coffee. The melting also slowed down as the milk was cooled by the frozen sphere. To everyone’s credit, there was only one episode of impatience leading to milk splashing out of the glass as an attempt was made to rotate the sphere and make it melt faster.. Overall, not really a drink to order if you need your caffeine fix quickly. Also, you might find it too concentrated towards the end, when the frozen coffee keeps melting and the milk that tempers it is dwindling. We found out, however, that they will bring you extra milk to top it up if required. The components that came out on the board. 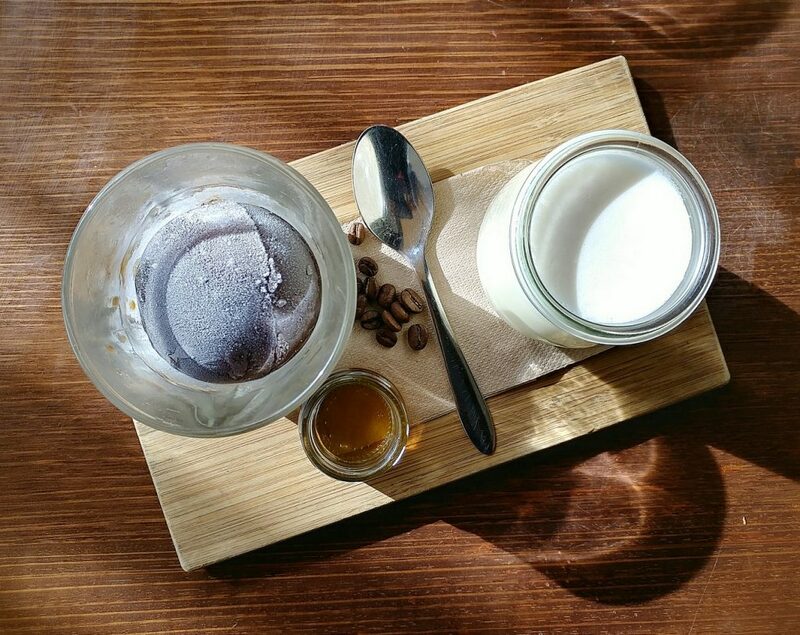 Frozen coffee sphere on the left, then the sugar syrup, and the hot milk. We didn’t eat the coffee beans. Another angle on the iced coffee. Flatlaying the ice coffee setup. The coffee sphere just starting to melt.. It took a while to get to that point. The dishes were all prettily presented when brought out. This was not a surprise, given their popularity on Instagram. They have clearly worked out that photogenic food promotes itself. 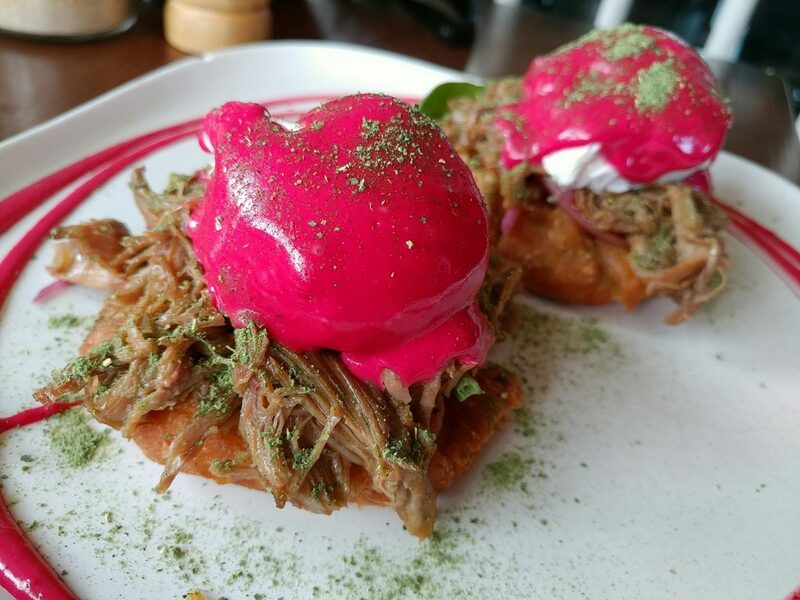 The Sous vide lamb shoulder benny came with pickled onion, baby spinach, poached eggs, and beetroot hollandaise on house made roti with kale dust. 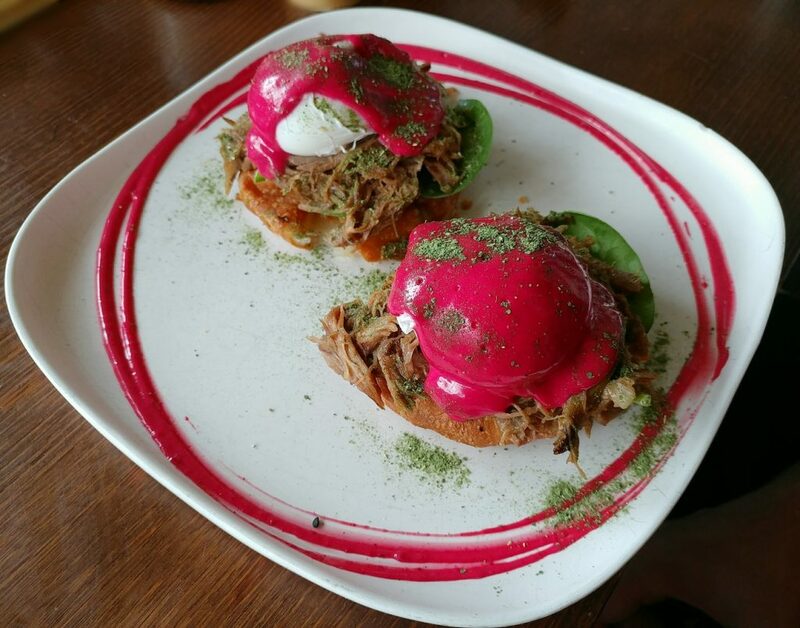 The beetroot hollandaise was a striking magenta with a vibrance we last saw at The Vertue of the Coffee Drink. Despite its warning shade, it was quite mildly flavoured, and creamy. The poached eggs beneath it were runny-yolked, of course (it would amount to sacrilege if not). The lamb shoulder was served pulled instead of as a large chunk. 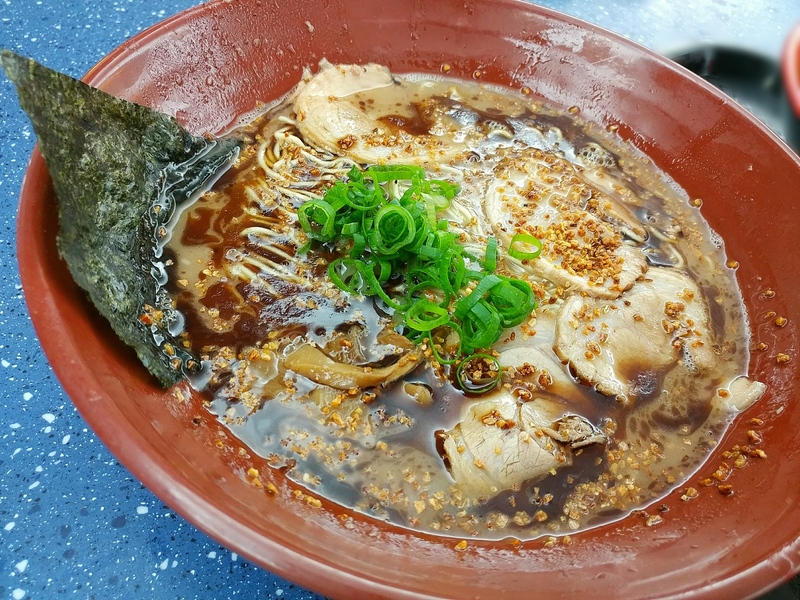 It was not overly shredded though, so it still retained meaty texture. It was tender, well-seasoned, and not too gamey. The roti that formed the base was puffed and crunchy, and provided a more solid texture to the dish. The kale dust added more colour to the plate, and allowed you to say you were eating your vegetables, but didn’t really bring much else to the dish. 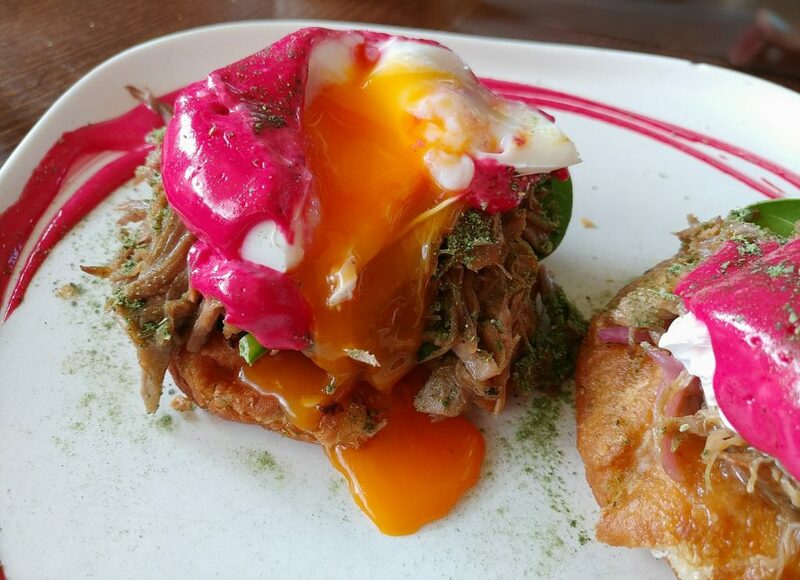 The Sous vide lamb shoulder benny with pickled onion, baby spinach, poached eggs covered with beetroot hollandaise, and house made roti, with kale dust over it all. More of that hot pink hollandaise. And one must have a runny yolk, of course. The Savoury glazed doughnut dish was essentially a doughnut burger, and was made with a double stack beef patty, double cheese, crispy bacon, and salted maple ganache. 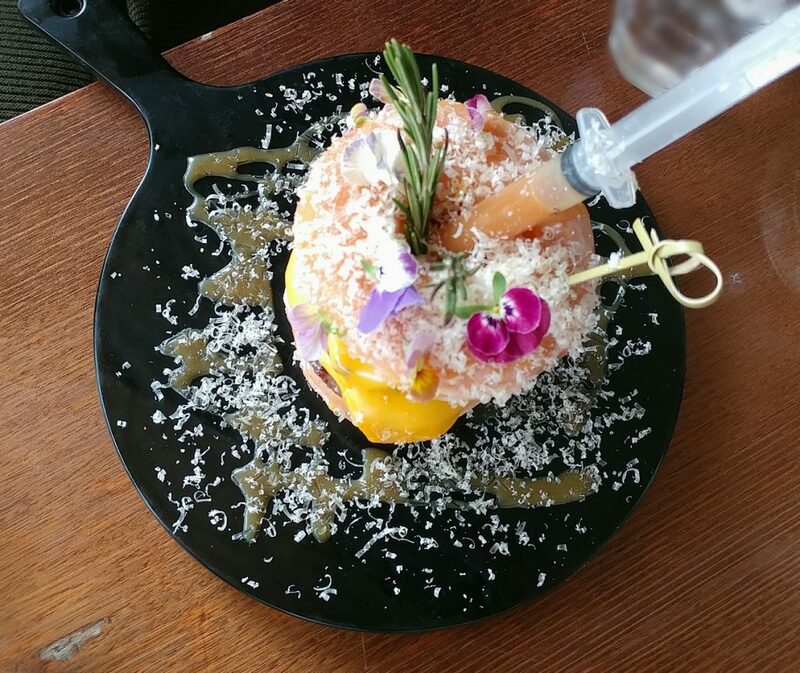 It was a dish that was ostensibly created with social media in mind. Quite unlike the giant monster burgers that are also popular to photograph, this was presented as quite a dainty creation, garnished with flower petals and covered with a snowfall of curls of finely shaved cheese. The glazed doughnuts that replaced the usual buns of a burger were soft and fluffy, and had a good layer of glaze with just that little crispness as you bit through it. The beef patties were meaty and a nicely savoury contrast. The cheese was soft and a little melted, and melded with the meat well. The salted maple ganache was kept separate, in a syringe, for diners to apply as much or as little as they liked. This was a good idea, because this was certainly a rich, intense sauce, leaning more to the sweet side, and would have been too much for some (like us) if it had all been served on the burger. 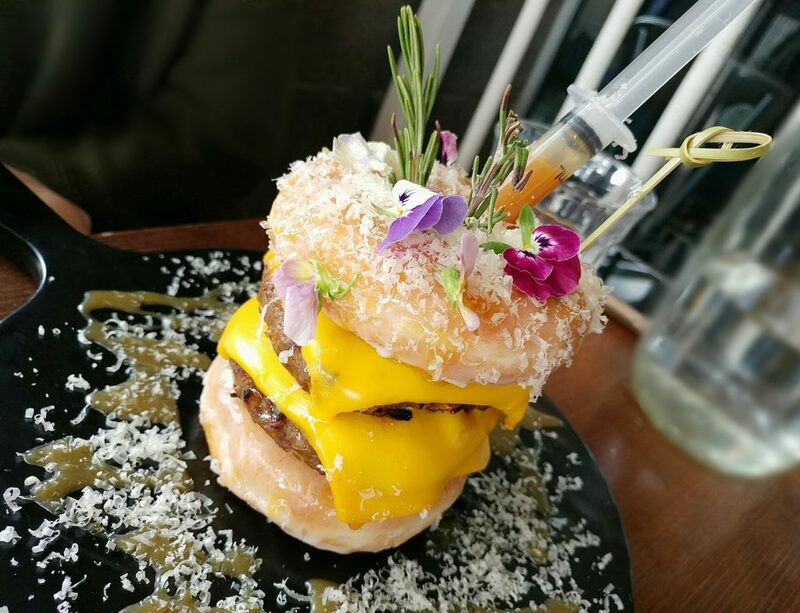 The very pretty Savoury glazed doughnuts, with double stacked beef patties, double cheese, crispy bacon, and salted maple ganache in the syringe. A top down look. The focus wasn’t quite right, sorry. The Bao Burger came with a crispy pork cutlet with baby cos, pickled onion, tomato, coriander, jalapenos, wasabi mayo, and chilli jam. It was had with the optional side of waffle fries for an extra $5. 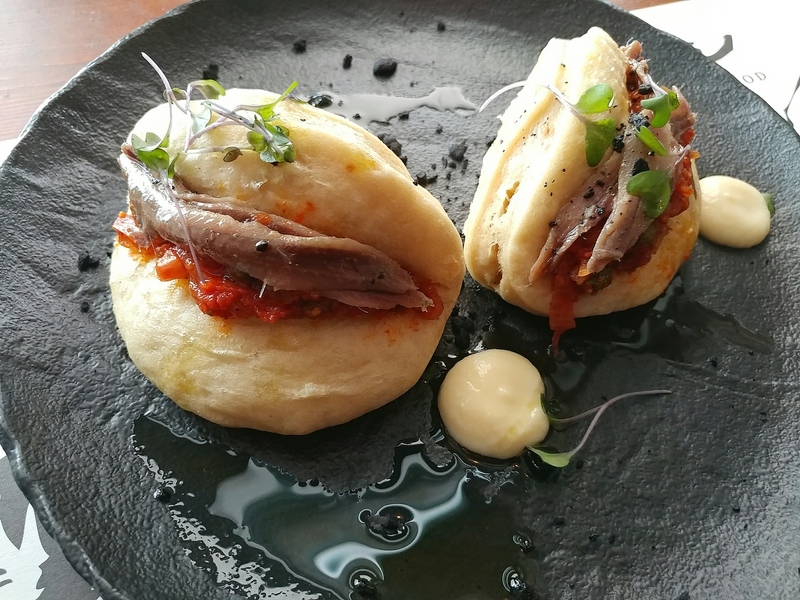 It was pretty typical for a burger, except for the replacement of a standard burger bun with a lighter bao bun. 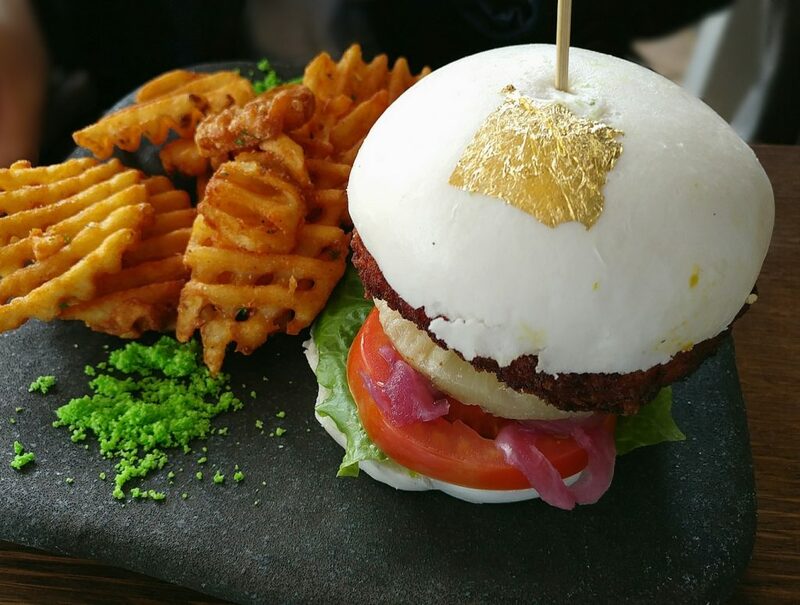 It was made prettier by a gold leaf square on the top of the bun. The pork cutlet was crumbed and indeed crispy on the outside, and nicely cooked on the inside. The waffle fries were crunchy on the outside, and well-seasoned. 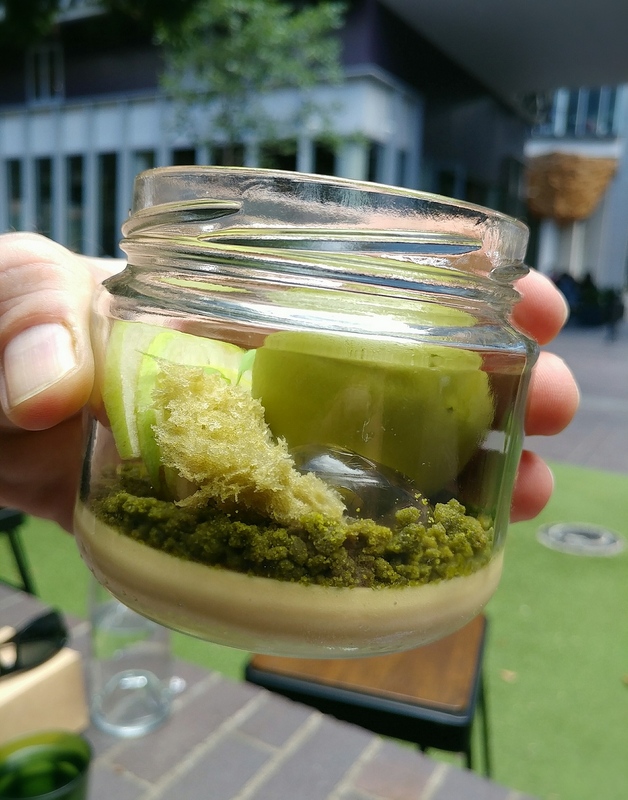 The wasabi mayo, interestingly, was made into a sort of dehydrated powder. It didn’t fit in the burger, but went well with the waffle fries. The Bao burger with crispy pork cutlet, baby cos, pickled onion, tomato, pineapple, coriander, jalapenos, and chilli jam. 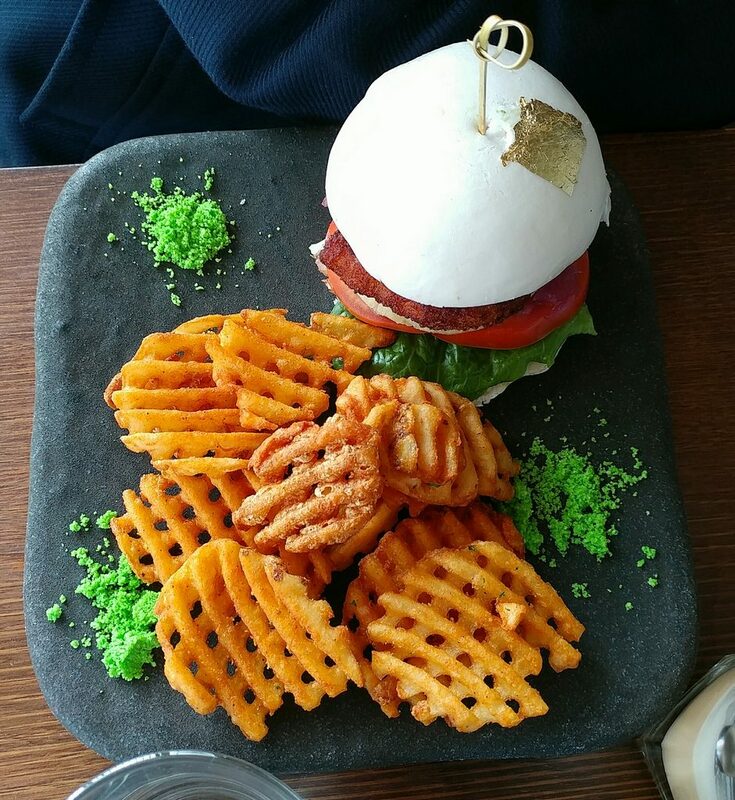 Dehydrated wasabi mayo in front of the waffle fries. Another view of the dish. 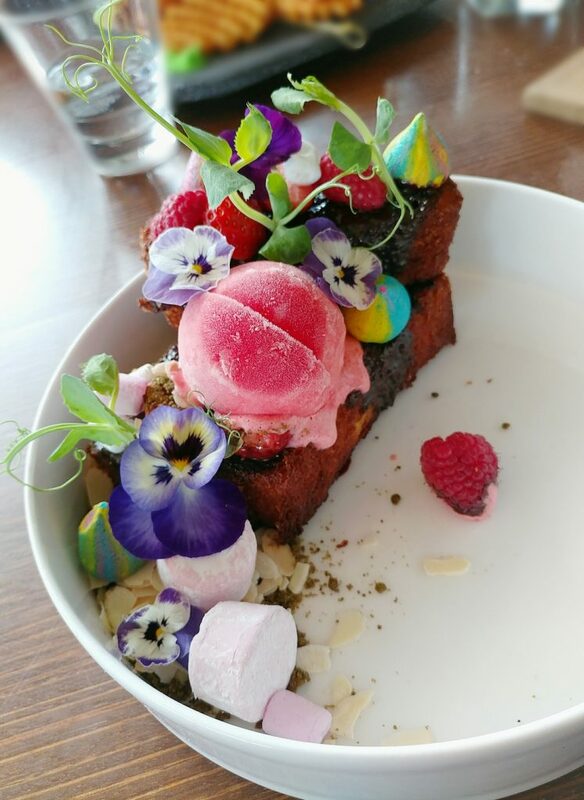 The French Toast churros came with marshmallow nibs, wild berries, matcha soil, hazelnuts, Nutella ganache, citrus meringue, and burnt marshmallows with raspberry sorbet. 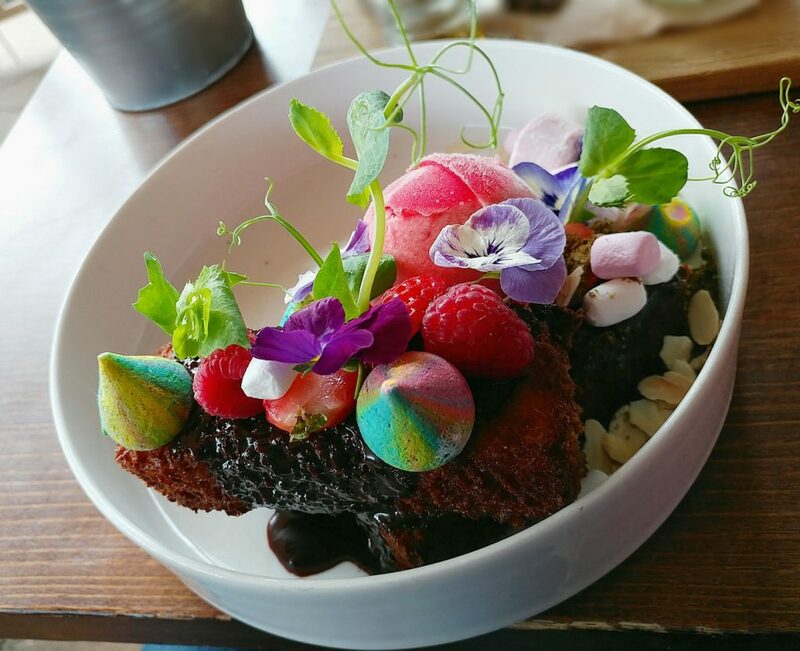 This was certainly the most gorgeous dish of all, like a rainbow in a bowl. 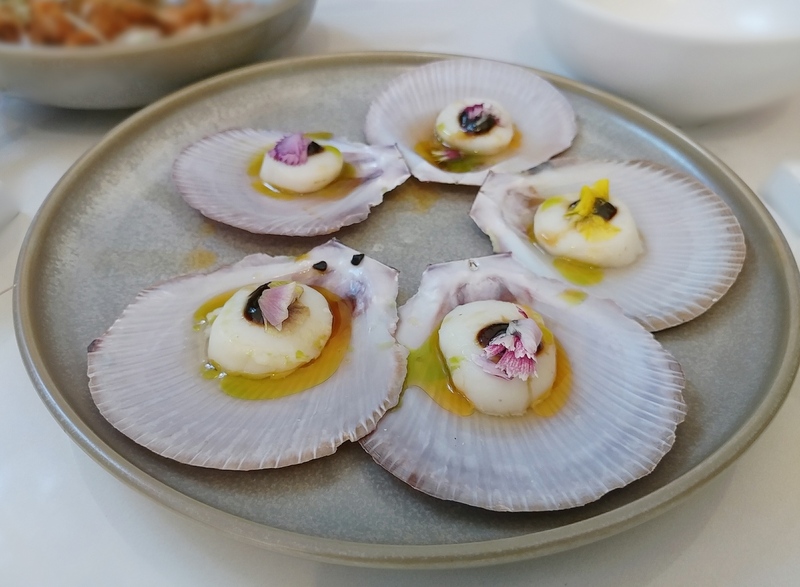 Using negative space with the plating concentrated the colour on one side of the dish, so the pinks and blues and purples played off each other for maximum effect. The edible flowers and pea shoot tendrils winding through it gave it even more of a fairytale look. The raspberry sorbet sphere had a fine grain, and had berry flavour without being too sharp. The meringue kisses were not only prettily coloured, but also had a lovely lemony flavour. The marshmallows had a good spongy spring, although we couldn’t find any of the burnt ones that were supposedly meant to be there. The churros, which had been done French Toast style, were light and fluffy in the middle, and had a satisfying crunch on the outside. They were buttery, and a little savoury, and, if anything, reminded us more of brioche than churros. The Nutella ganache drizzled over them was , surprisingly, not sweet, but definitely chocolatey. The Matcha soil and sliced hazelnut in the corner added more crunch to the dish, and yet another flavour dimension. 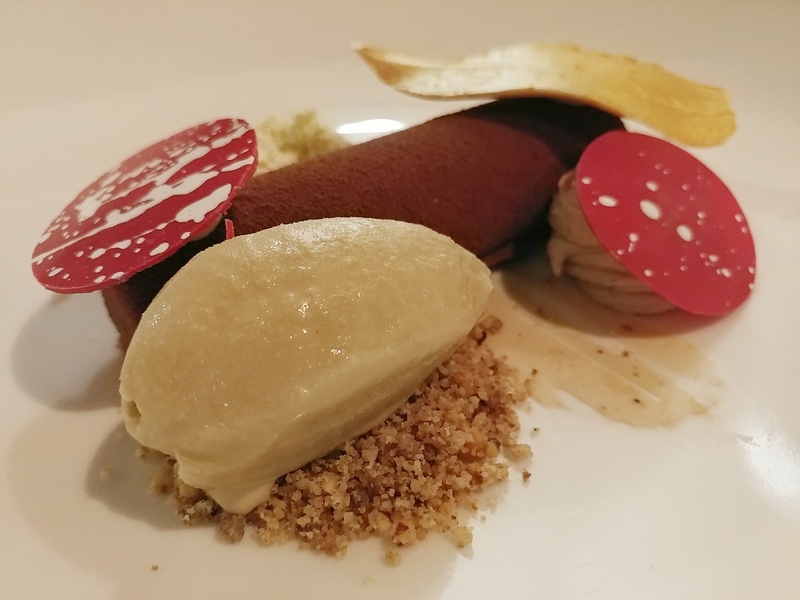 On the whole, despite it being listed under Sweet Treats, and despite the components sounding like one would have a sugar overload, the dish was actually well balanced, and not too sweet. 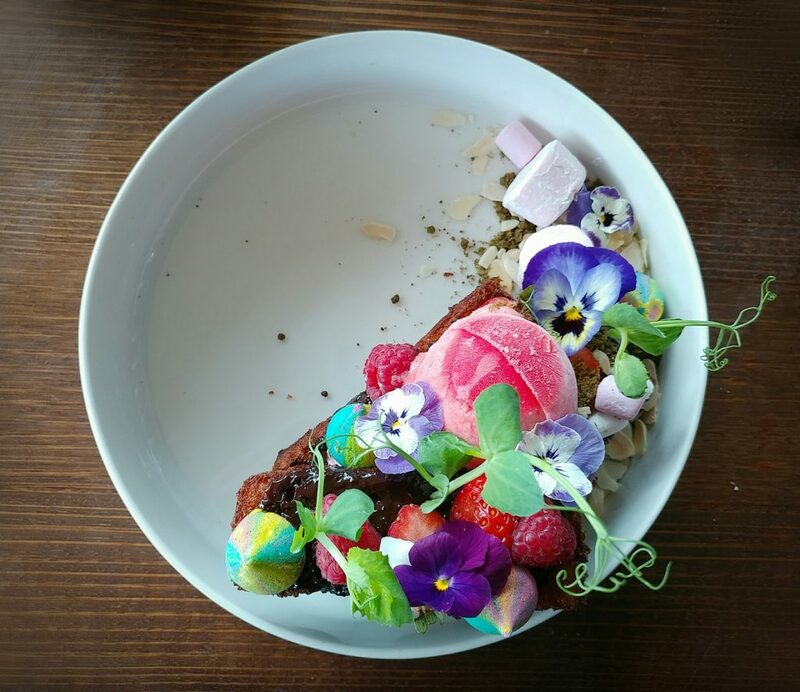 The French toast churros, with marshmallow nibs, matcha soil, hazelnuts, Nutella ganache, citrus meringue, and raspberry sorbet. Showing off more of those colourful components. More of that pretty rainbow in a bowl. 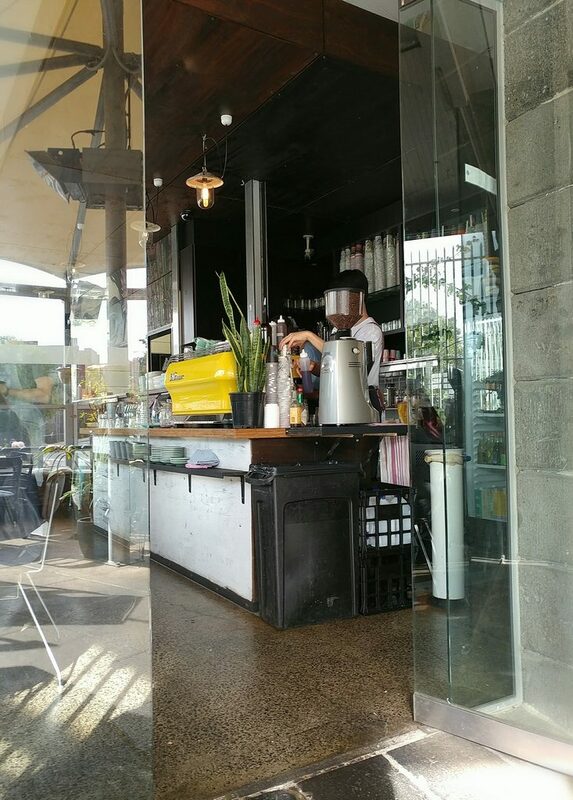 The Glass Den would fit right in with the Fitzroy brunch spots. They know how to present their dishes, and for the most part the food was quite tasty. Sometimes it was a visually striking way of presenting what would otherwise be a quite normal food. We do, however, eat with our eyes first, so this is a smart move. Worth visiting mainly to meet the food you will already have seen in many pictures by now. One more look at the French toast churros dish. Price point: $17 to $25 for things more substantial than eggs on toast or spreads on toast. Value: It wasn’t cheap. They were pretty, but also pricey.